Destination Weddings in Florida allow you to relax, and enjoy the natural beauty in the world. Your guests will be excited to travel to the sunny state of Florida for a fresh breath of air and a wedding celebration they will never forget. Each city has many unique and fun experiences for you and your guests to enjoy and make memories. 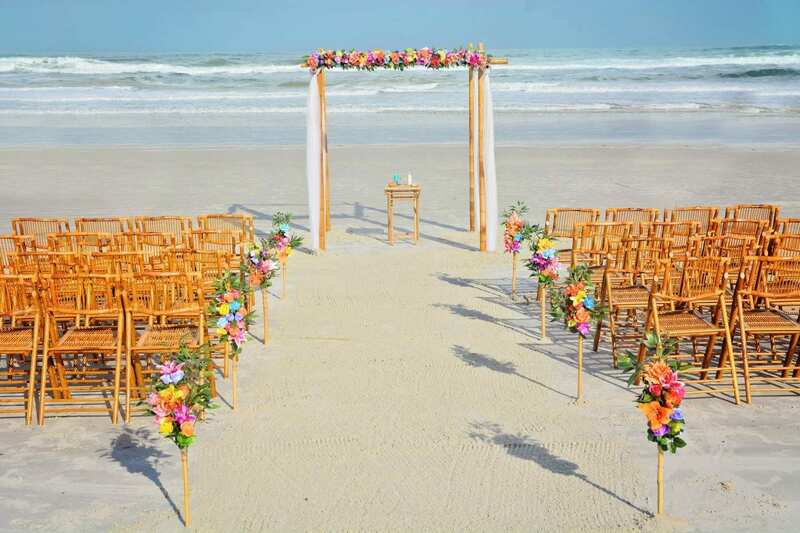 Destination weddings in Florida are great for groups of any size. Our Florida Destiny Beach Wedding Package is great for the couple that wants to be surrounded by friends and family as they say “I Do” by the shore. With endless options to customize this beach wedding package, you will be able to create a package as unique as your are. Everything included in this Florida beach wedding package is clearly listed below in the package description. Our Aloha Destiny Package is the same price as our standard Destiny Package. With a four post bamboo canopy, bamboo pole and tropical flower aisle-way, large tropical flower canopy topper, your choice of bamboo canopy material, up to 24 white deluxe or bamboo chairs, and all the other details of the Destiny Package. Are you looking for a more journalistic approach to your ceremony photography? More poses, for example “trashing the dress’ or a large outlined heart in the sand? Hire our exclusive wedding photography company: Forever in Love Photos. If you hire her for your ceremony photography, she will replace our staff photographer. She will take all of your ceremony photos, as well as all the after ceremony photos at the beach. If you hire Forever in Love Photos for your beach wedding ceremony, she will take the place of our staff photographer. And, you will receive a $100.00 credit on your package when you use her photography services (this credit cannot be combined with any other discounts, and this credit is not available for the Simply Package). Once your photos are ready, you will be able to download them for free (no purchasing prints from us!). A photo CD is available upon request for only $25.00 (shipping and handling fees). You will need to contact them directly, to check their pricing, and availability. There is no better place to start your new adventure in life than the beautiful, romantic beaches of Florida. 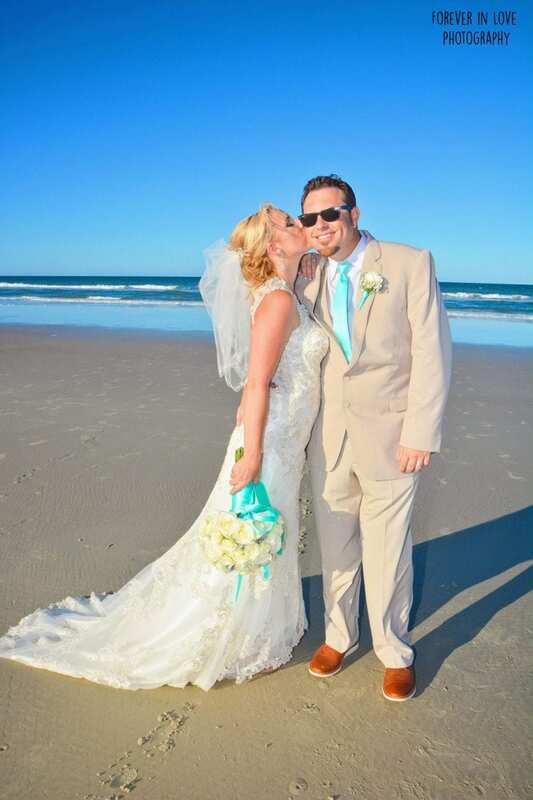 With all of our destination weddings in Florida, we make sure that you know exactly how your beach wedding will happen. You purchase the package and simply change the colors, flowers, ceremony to be read and music selection, so you can rest assured knowing exactly how the set-up will look. We also provide you a wedding ceremony timeline. This will be specific to your wedding and will tell you when your guests should arrive to the beach, your groom should arrive, and where we will meet the bride. Destination weddings in Florida are meant to be stress free and elegant. We strive to continue to make sure our beach wedding decor is modern and classic. We provide options for the boho beachy bride, as well as classic floral designs for the more traditional bride. Our Florida Destiny beach wedding package is great for the bride who wants to be surrounded by friends and family during her destination wedding in Florida. This beach wedding package offers the bride the most choices for her wedding decor. With over 20 different color choices for the bamboo canopy, multiple choices for your canopy topper, a variety of aisle-way choices and an extensive list of ceremony music choices, you can make the wedding of your dreams a reality. Our destination weddings in Florida are meant to make each and every bride’s style stand out. Contact us today to start planning your destination wedding with a professional and reliable company.